You may know helium as the gas that can make balloons and blimps float. At the University of Maryland, scientists are using this element to study the exotic physics of quantum vortices: the tornadoes or bathtub-drain whirls of the quantum world. 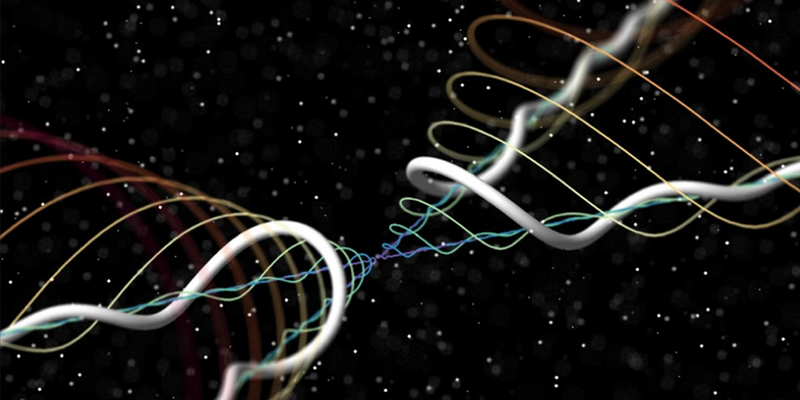 Unlike these large-scale events, we do not understand exactly why quantum vortices form. Knowing why these interesting events occur, and how they work, could help us better understand other turbulent events (wind currents, ocean currents, river flows), as well as the complex physical behavior of superconductors and neutron stars. When cooled to ultracold temperatures (around 2 degrees Kelvin), helium becomes a liquid whose behavior is governed by quantum order. This includes the formation of quantum vortices. While other gases become liquid at low temperatures as well, they also turn solid to some extent. Helium is the only gas that remains purely liquid, allowing scientists to explore quantum vortices. When two traveling vortices meet, they undergo a violent event known as reconnection, which generates helical waves. Figure 1 shows an artist’s rendition of these helical waves, emanating from a reconnection point in the center. But how do we know all of this? Maryland researchers have created a technique that allows them directly to observe quantum vortices and reconnection. They first inject fluorescent nanoparticles into the ultracold helium (as seen in Fig. 2). These particles become entrapped by quantum vortices and follow their motions, similar to dew drops on a spider web or water vapor in a tornado—you can see the drops, but not the rotating air column itself. Using cameras, the scientists can then image vortices (as seen in Fig. 3) and even reconnection events (as seen in Fig. 4). In the past year, Maryland researchers have built a three-camera system to image the vortices from three different angles. This has allowed them to observe for the first time in three dimensions the formation of the waves caused by reconnection. 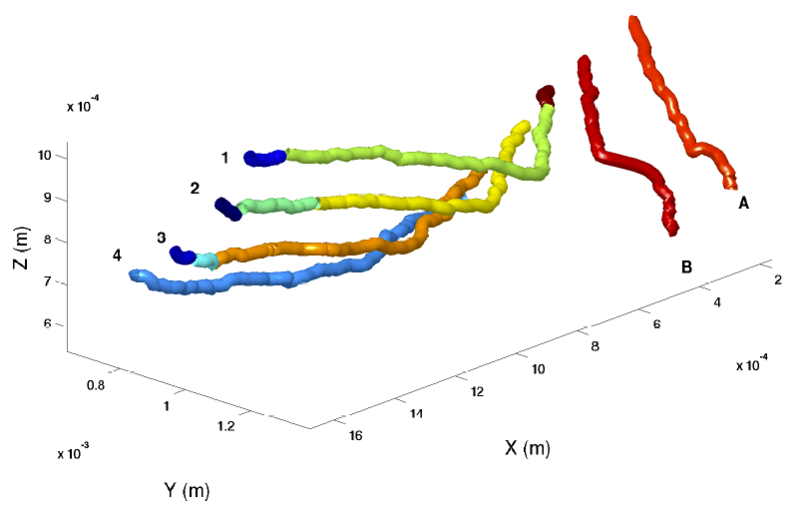 Figure 5 shows a 3D computer reconstruction of a reconnection event. With these techniques established, the Maryland scientists hope to determine what causes vortices to develop, as well as the function of reconnection events and the helical waves they produce. New knowledge about quantum vortices can be applied to other systems as well. Related magnetic vortices occur in superconductors and can lead to a loss of supercurrents; understanding how and why these vortices form would enable researchers to improve superconductor performance. Meanwhile, neutron stars are thought to contain arrays of quantum vortices that determine how they rotate. Helium is an easier model system to visualize and understand the behavior of these vortices—and not as remote as a neutron star! Learn more about quantum vortices in superfluid helium in the first video below. In the second video, check out Physics Girl’s experiments with vortices you can create and view yourself using an ordinary dinner plate in a swimming pool! Fig. 2 (Click to enlarge) Counterflow of superfluid helium and turbulent decay. Fig. 3 (Click to enlarge) Quantum vortices in a rotating container. Fig. 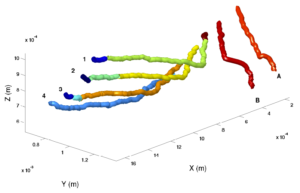 4 (Click to enlarge) Reconnection of quantized vortices in superfluid helium.